Matawalu was a free agent after leaving Exeter Chiefs and has signed a one-year deal, subject to being granted a visa and passing a medical, with the option of a second year. 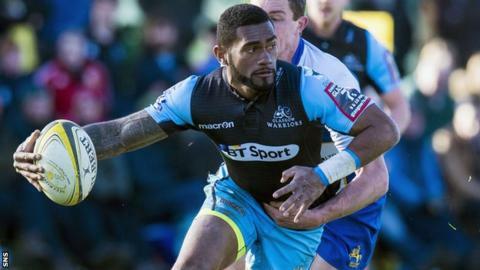 The 28-year-old, who has 32 Fiji caps, left Glasgow in 2015, after helping the club secure its first Pro12 title. "I'm very excited to be back in Glasgow," Matawalu told the club's website. "Glasgow Warriors was my first professional club and first club outside of Fiji, and it's where I met a lot of good people. "[Head coach] Dave Rennie is a very good person. He's very down-to-earth and he had a good chat with me before I decided to come back. He's a good man. "I always play like it's my last game and I'm really looking forward to playing in front of the fans again." The free-spirited back was released by Exeter this summer after failing to make an appearance. He appeared in court charged with sexual assault in March, but was cleared of the charges earlier this month. In his three years at Glasgow, Matawalu's dazzling array of skills and unpredictable attacking play helped cement his status as a fan favourite among the Warriors support. He made over 70 appearances for the club, scoring 26 tries, and was voted player of the season in his final year. Matawalu left Glasgow for a lucrative contract with English heavyweights Bath, but struggled for fitness after his move, making only 10 league appearances before joining the Chiefs. in November last year. The playmaker, who can also be deployed on the wing, started three of his country's four 2015 Rugby World Cup fixtures, and was in the Fiji squad for their trio of June internationals, although he did not feature in the win over Scotland. "I've seen Niko play a lot of test footy for Fiji and for Glasgow Warriors, when they won the title too," said Rennie. "He's a bit of a freak on the field, he's a game breaker. "I know he was incredibly popular here with the fans and when I met with him he made it very clear that he was very passionate about Glasgow and wanted to come back. "We've got three really good nines already, Henry (Pyrgos) and Ali (Price) are Scotland internationals and George (Horne) has really impressed us in pre-season. "Niko is going to have to work really hard, but the fact that he can play on the wing and at full-back is a bonus and his utility value will help us during the Autumn Tests and Six Nations periods. "He's been out of footy for a fair amount of time, so the next month will be about getting his body right so that once he gets his opportunity he's ready to fire."